Here you can view a 2.5 minutes screencast of how to initiate a Wimba Classroom session with Appsharing. Local frame to select screen portion shared. Now students can share a Moodle or other online assignment or all local text file with their tutor; users in need of computing support the offending application. Zip the folder, e.g. using the built-in Windows right-click/context menu option “send to”/ “compressed file” (for more options, install the free 7-zip is more powerful, which is required on Windows XP if your file names contain foreign language diacritics). No need to create a folder since this is done automatically (advantage: keep files manageably together, e.g. 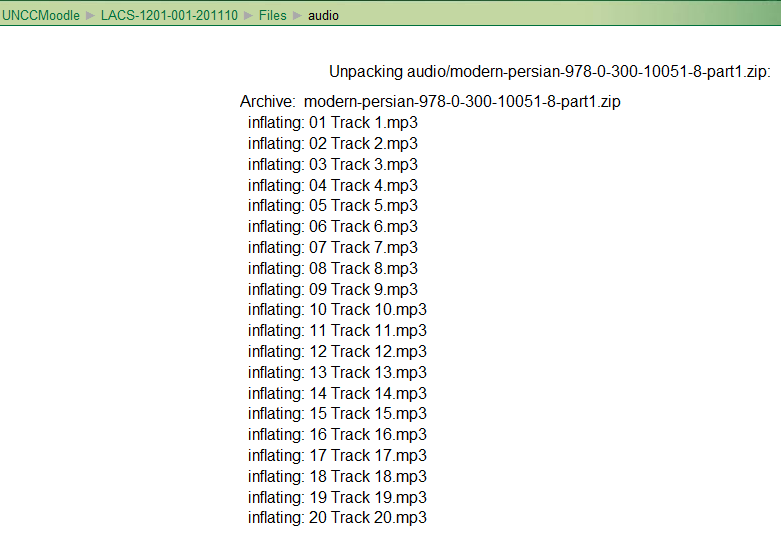 applying student permissions to an entire folder set of files versus individual files – disadvantage: you may run into our Moodle file size limit (as of 2011-05 64MB for individual files, including the uploaded zip-file; you may ask for an increase or TBA:compress your audio files) . Once the file appears in the folder, there will be a link “unzip” to the right of it: Click it. Once the initial files appear in the folder, you can and may want to delete the zipped file. Section / drop-down:“Resources” / “Display a directory”. Enter a descriptive Name (your folder name will not carry over). 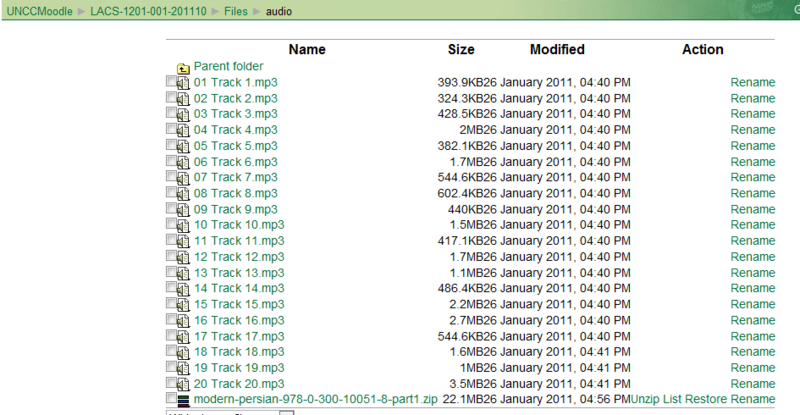 You can enter a description of the file if you want into the Summary field. This is optional. Under “Display a directory”,’ select the desired folder directory from the pull-down menu. Click “Save and Display” to check the results. Right-click on your page with the media you want. A chime will alert you when your downloads are ready for consumption. Enjoy! The most useful tools in Wimba Classroom for synchronous one-on-one online tutoring, apart from the basic text instant messaging, may be not the videoconferencing, but the audio tools combined with screen-sharing or application-sharing AKA desktop sharing (remote user can control the application – especially for reviewing online learning materials with automated feedback which the student may need additional help with. we thought that especially the application screen sharing in wimba would be useful, e.g. if tutor and student go through some of the online exercises together live and the tutor can answer additional questions of the student that the automated online correction has not answered). First watch an archived session held using Wimba classroom: Both the vendor (TBA) and the CTL have archived sessions, including introductory sessions on the use of Wimba Classroom and components. Then take the student perspective: You can anticipate student issues and learn from/with the teacher without full responsibility for the session, if you participate in a live session using Wimba Classroom., like the ones the CTL regularly offers (the next one: http://teaching.uncc.edu/how-do-i-moodle-more-course-web-site-30-min-webinar). Read the FAQ, to learn from colleagues with a similar background/context: Intricacies of the talk button (keep it pressed, or set the options so that you do not ; video/audio/text out of sync may indicate slow internet connection, consider dropping video, the biggest bandwidth hog. Practice makes perfect: Once equipped with a computer, I plan to test out the Wimba Classroom instructor room, by using it for intra- and inter-office communications. There are competing platforms that I like, e.g. MS-Communicator with its strong presence and escalation features. But Wimba rooms which span students, teachers and staff – any staff member has one by default, any student can enter a room -, have the strongest network effect). Meeting online with small student groups, e.g. when planning or reviewing student groups projects. Before you do this and for your specialized features, you may want to review in–depth multimedia documentation: Wimba Classroom has in depth print manual for presenters and students. Screencast videos (Using Audio, Web Page Display, Application Sharing) are instructional, 1-page “cheat sheets” (Web Page Display, Application Sharing) are perfect for putting up at your computer during your first session. Once you are experts, don’t forget that your studentsmay not have used Wimba classroom. All participants must run the Wimba wizard well ahead of session, to be able to address any technical problems before entering a classroom. You can watch the Wizard at work in this screencast video. Mandarin has a non-alphabetic script (mainland China “simplified” theirs, as opposed to Taiwan and other “traditional” Chinese communities, while e.g. Vietnam has Romanized the writing system). A common workaround, when starting to learn Mandarin, is first using only Pinyin, one of the Romanized phonetic transcription systems for spoken Mandarin which includes special markers for the most common 5 tones. Typing the tone markers on a PC needs a special program. A number of tone marker input editors are available (see PinyinJoe’s list). I have used and supported PinyInput, which works similarly to Pinyin input IMEs used by native speaking PC users. Instead of offering, in a popup window, Mandarin script when typing with an alphabetic keyboard, PinyInput offers tone markers. A 1-minute screencast hopefully says more than 1000*fps*duration words: Watch this PinyInput demo. Enter the info you have been given and click check names. I did not need to enter “More Settings”. One of quite a few oddities I observed: After creating the Exchange account in the Control Panel: Mail item, when starting Outlook, the Windows Security dialogue that asks for my credentials appear to not accept my password (it comes up over and over again, asking for the password). However, once I canceled out of it and restarted Outlook, Outlook went right into downloading my Exchange mail etc. (this was with “Remember my credentials”set in the Windows Security dialogue). Go figure!